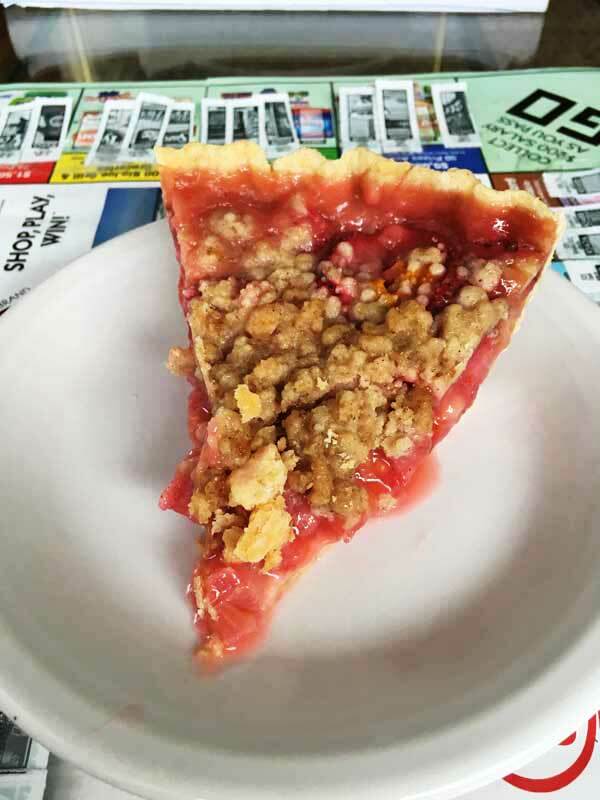 This flavor of this strawberry rhubarb pie is sweet, tart and full thanks to the combination of fresh rhubarb, strawberries and (especially) orange zest. The amount of topping listed below is how much I used, but if you love crumb topping I recommend doubling it. Heat oven to 400 degrees F. Set a foil lined rimmed baking sheet on the middle rack. Stir together the sugar, flour and salt. Sprinkle about a tablespoon of the sugar mixture over the bottom of the unbaked shell. In a large bowl, stir together remaining sugar mixture, rhubarb, strawberries and orange zest; set aside while you make the topping. Mix the flour, brown sugar, granulated sugar, cinnamon and salt together in a large bowl. Combine melted butter and vanilla and pour over mixture. Stir until crumbly. Spoon the rhubarb mixture into the pie shell, then sprinkle topping evenly over the pie to cover completely. Set the pie on the hot baking sheet and put it in the oven. Bake the pie at 400 for 25 minutes, then reduce heat to 375. Lay a sheet of foil loosely over the pie and continue baking another 40 minutes. Remove foil after 40 minutes and if crumb topping isn't brown enough for you, bake for another 10. Let cool completely on a wire rack. Do not cut into the pie until it is completely cool or it will be runny. For best results, let cool completely and re-warm. If you use frozen, you should probably thaw it out and drain off the excess liquid before mixing.